14 night fly drive includes flights, car & hotels. Enjoy the rejuvenating qualities of long, dry sunny days and exceptional southwestern hospitality with visits to some of North America’s most spectacular National Parks. We’ve created a holiday experience where you will see lots, but return home feeling rejuvenated and wanting more. If you like the idea of venturing out of your resort why not check out the historic old town or the myriad of fabulous shopping opportunities in the area. Visitors can also enjoy a multitude of outdoor adventures and activities including hot air balloon rides, off-road desert tours, horseback riding, rafting, hiking and more. Scottsdale is famous for golf with hundreds of courses to choose from in the area, so this provides yet another leisure option for you as you take the day to adjust to the time difference – or why not just sit back relax and enjoy your surroundings before embarking on your driving tour tomorrow. This drive will take you about 4.5 hours. A very straight forward drive, dual carriageway as far as Flagstaff from where we suggest you take the more scenic Highway 180 through the hills and forest that surround Humphreys Peak, the highest point in Arizona – watch out for deer and other wildlife along the route. Then cameras at the ready as you enjoy a spectacular sunset over the Canyon! Hot Tip: Be sure to purchase the National Park Pass at the entrance. This pass is good for entrance to all National Parks in America for 12 months, without it you are likely to spend twice as much during this trip on entry fees. After watching the sunset we’d suggest a nice meal back at the hotel and an early night, you might still be tiring early due to the jet lag and you have another fun filled day ahead tomorrow. 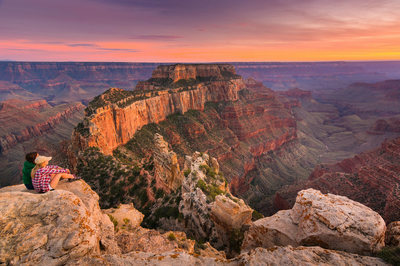 Start today by returning to the Grand Canyon South Rim Village and take Highway 64 East. This road will take you along the rim of the Grand Canyon where you can spend a couple of hours stopping at the pullouts for views across the magnificent Grand Canyon. Eventually you will leave the National Park boundaries and continue along US64 before joining the US89 North. You are now in the lands of the Navajo Indian Nation. We suggest you take the scenic ALT89 highway towards Marble Canyon and Jacobs Lake and continuing on to the Zion National Park entrance. After entering the park you will enjoy many pullouts for photos as you descend down into the canyon of Zion National Park, this is a truly stunning part of the drive. Eventually you will leave the park and almost immediately see the Cliffrose Lodge on your left on the edge of the community of Springdale. A well as being a lovely little property, the great advantage of staying here is that you can avoid the acute parking problems within the park and walk to the Visitor Centre from where the complimentary trolley tours along the Canyon depart from. You cannot drive your car along this route so the trolley tours are a must. After a long drive and mindful that you have a full day tomorrow to explore the park tomorrow we suggest you relax and maybe take a stroll into the very pleasant community of Springdale where you will find some interesting shops and a small selection of excellent places to eat. The Bit & Spur does a tasty Mexican dish! Hot Tip: The states of Utah and Colorado along with the Indian Reservation Lands observe daylight saving time and so are 7 hours behind the U.K. Arizona does not and so is 8 hours behind the U.K. It’s good tip make a note of this as it can become confusing as you move locations. The Pioneer Lodge Restaurant in the heart of Springdale does a hearty breakfast, the ideal preparation before you head for the Visitors Center at the park entrance. Leave your car at your lodge and walk into the park, the trolley tours operate constantly all day and there are too many stops to count as the trolley buses amble along the Canyon. You can hop on and off at all these points where you will find a selection of short walks and longer hikes. The Visitor Center has details so you can select something that suits you. The Museum stop is a must. After a leisurely day in beautiful Zion National Park return to the Lodge to relax and maybe take a refreshing dip in the swimming pool before grabbing a bite to eat in Springdale – tomorrow you head for Bryce! Take the same route out of the park today; it’s amazing how driving the same route in a different direction gives you a whole new perspective. You have a leisurely 2-hour drive to Bryce Canyon National Park today and we suggest you set out early so as to get to Bryce and spend at least a good afternoon there. The visitor Center in Bryce at the entrance is well worth visiting to see a free video presentation and to check on current weather conditions. Due to the high elevation of the park snowfall is common right up until the middle of May. Bryce is a stunningly beautiful site, very different to anything else you will see, perhaps the highlight being the view from Bryce Point – the pictures give you an idea of what to expect but in no way capture the impressive experience of actually being there. Highway 12 from Bryce to Torrey is a designated Scenic Byway and it does not disappoint. A little more challenging than you will have had in past days with more steep hills to climb, lots of tight turns and switch backs. You climb up to about 10000 feet at one point, remember to watch out for the wildlife it’s not uncommon for deer to step out into the road in front of you. If you made an early start as we suggest from Bryce it will probably be a little too early to check-in so we suggest you continue along highway 24 for approx 11 miles to Capitol Reef National Park visitor centre. There are 2 possible routes you could take to Moab but you should definitely take our suggested route following highway 24 east and then highway 95 south through White Canyon. Another designated scenic route, this really is a lovely drive where if you have it you can engage the cruise control for large parts of the drive and the beautiful scenery that surrounds. We love the town of Moab, surrounded by beautiful red rock hills it has a slightly carefree feel, probably much to do with the activity-based focus of the town as Moab is considered the mountain biking capital of the world due to the large number of exceptional slick rock trails in the region. You can also enjoy river rafting and jeep trips from here also. The reason we have brought you to Moab for 2 nights is so that you can visit Arches and Canyonlands National Parks. Depending on your arrival time you could visit one of them this afternoon or leave both until tomorrow. Both warrant 4 hours really as there are some nice short walks at both. As we previously said we have given you a full day to enjoy Moab and in particular the excellent National Parks of Arches and Canyonlands we would suggest 4 hours in each. If you are looking for a short pleasant walk I would recommend the trail to Landscape Arch which is about 2 miles round trip. There are a number of longer well-marked trails in both parks if you would prefer. At the end of the busy day choose from the many places to eat along the main street or if you want a tip, visit the Moab Brewery, where they have a great restaurant and you have the chance to enjoy some of the locals beers brewed on-site. Another good place to eat is ‘Zax’ located on the main street, just a very short walk from your hotel, it’s nice to sit on the outside patio here to eat and do a little people watching on Main Street. Both offer a wide variety of American style food. Moab enjoys excellent weather for the most part all the way through the summer months, already reaching the mid 70’s in April continuing up to 100 in July and only dropping to the mid 70’s again in October. There is very little rainfall during the summer. These temperatures are an average. If you managed to squeeze one of the National Parks in yesterday or would rather try a little adventure today there are numerous outfitters, and tour companies dotted along the main street where you can book on to organised cycle tours, jeeps tours and of course river rafting trips. If you would prefer Complete North America can arrange rafting trips for you in advance of your arrival in Moab. A straight forward drive, nothing much to see on en-route so suggest you dead head straight for Mesa Verde National Park. Once again our plan works on the presumption that you will start out early for this 2 hour drive and get yourself to Mesa Verde ideally by 12 noon. The climb up into Mesa Verde from the entrance is steep with lots of switchbacks and will take you about 45 minutes to reach the visitor centre at the top. Hot Tip There is an exceptional restaurant we can personally recommend at Far View Lodge in Mesa Verde National Park – a total surprise and quite unlike National Park accommodation! The restaurant has stunning views of the canyons and valleys so even if you have to wait awhile ask for a table near the window. If you do have to wait go upstairs for a drink in the small bar where there is a patio balcony. If you wanted to go straight to Monument Valley then it is in fact only 150 miles and if you want to do a horse back ride or jeep tour around the valley then this is what you should do. We recommend that before heading for your night in Monument Valley you head south west for a stop at For Corners (The only place in America where 4 states meet) and then continue south to the town of Chinle and the impressive Canyon De Chelly National Monument. At Chinle you are deep in the heart of the Navajo Nation so it’s an education to see how the community is living. Chinle is not particularly impressive which is why we recommend doing a driving along either the north or south rim of Canyon De Chelly before continuing on to Monument Valley. If you are happy to do either one or the other and stop at most of the pull outs for viewing then you should allow 2-3 hours. If you wanted to take one of the available jeep rides down into the Canyon you should allow longer and consider an overnight stop here. The Canyon is very interesting with small ancestral Indian ruins and ‘Hogans’ – small traditional huts that the Navajo farmers still live in to this day. The drive from Chinle to Monument Valley will take you about 1 hour 30 minutes and the last 30 minutes as you approach Monument Valley is really quite spectacular. Where availability permits we look to book you into Gouldings Lodge where every room enjoys a superb view of Monument Valley. Gouldings Lodge was one of the first trading posts in the west set up by Harry Goulding to trade with the Indians. It is also famous for featuring in many famous western movie classics featuring John Wayne and Clint Eastwood. Parts of the movie Back To The Future were also filmed here. There is a museum on site, which is well worth a visit. At 265 miles we’ve built in the option here to go up to Lake Powell before heading south to Sedona. If you were to go directly to Sedona and miss out Lake Powell then the journey would be 180 miles. If you set out early from Monument Valley you can get up to Lake Powell for lunch at the Lake Powell Resort overlooking the lake, however if you wanted to do one of the boat trips then we would need to look at timings for this. After lunch at Lake Powell continue south to Oak Creek Canyon and the beautiful red rock town of Sedona, your final destination. As you leave Interstate 17 on U.S. highway 89A you will start to descend quite rapidly into Oak Creek Canyon, this part of the drive is particularly scenic. We want you to return to the U.K. not just raving about the wonderful things you have seen but feeling rejuvenated and not needing another holiday to get over this one. So kick back enjoy the lazy pace of life in beautiful Sedona, soak up some sun and take it easy. Today is a very easy 2.5-hour drive back along Interstate 17 and the airport is well signposted. With an evening departure you have no need to rush, take your time at the resort, enjoy breakfast before heading out. Follow the signposting to car rental returns where you will clearly find the Alamo depot. Follow the signposts to the car return aisle then wait with your vehicle for the Alamo agent to check the car over and issue you with your receipt before boarding the transfer back to the terminal. Be sure to advise the driver which airline you are with before boarding the bus as different buses go to different terminals. Enjoy free GPS on your Grand Canyon Country fly drive. Other operators will charge hundreds of dollars for GPS – with Complete North America you pay nothing!